Minutes from the Paris end of Collins Street the gleaming towers of Melbourne CBD and the historic Princess- Regent and Her Majestys theatres Fraser Place Melbourne offers discerning business and leisure travellers affordable 4-star accommodation in a fantastically central location. Fraser Place Melbourne comprises 112 beautifully appointed studio apartments each containing modern kitchenettes and private ensuite bathrooms with walk-in showers. 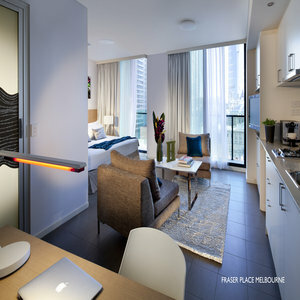 Each room boasts a 32 inch LCD TV- 8 free Foxtel channels- Movies on Demand- iPod dock/clock and WIFI Internet access. Our friendly reception desk is open 24 hours. Fraser Place Melbourne is a non-smoking property.